A recent thread on sound, reminded me that it's been three years since I reported here on my orthosonic lift (O-lift) invention. I've been busy with it and thought an update might be of interest. Summary: Orthosonic lift is my just-patented means of deriving aerodynamic lift from sound waves. It is exceedingly efficient and surprisingly quiet. The method recruits alternating current (AC) into the field of fluid dynamics where, until now, transport applications have exclusively employed direct current (DC). The present embodiment is a tracked-flight system, which will not compete with conventional aircraft but instead, extends aviation into the realm of very close quarters. This is envisioned to include ceiling and wall crawling robots, cableless elevators which freely traverse a vertical wall, and mass transit, as an alternative to maglev. zero flow (lower surface) - who wants any "down lift"? AC flow is restricted to the desired surface only. zero down draft - and no vortex shedding. You won't need so much hair gel! zero translation - O-lift is essentially pure. Forward motion is not required, though some configurations can provide that. zero rotation - I'm tall. It gives me the willies walking under spinning helicopter rotors! zero maintenance - how often do you "maintain" your audio system? distributed drive - engines arrayed, as advantageous, over the wing, the track or both. There's only so much I can do from my basement lab. I'm seeking a university collaboration (perhaps an associate professorship), under the auspices of which, to pursue research funding form government or industry to more formally characterize and optimize O-lift. Alternatively, I could try crowd sourcing or a development license to industry directly. The fact is, being good at inventing and experimenting does not automatically make me good at grantsmanship or marketing. Suggestions are welcome. It will take me about 8-10 Blue-Titled posts to bring you up to date. Feel free to interject at any time. O-Lev mass transit as an alternative to maglev? If it doesn't give up too many proprietary details, I'd be interested in seeing an introductory overview about how you convert whatever power source you're using into kinetic energy for lift/locomotion, via sound. I promise to keep an open mind. That's my job title. I'm the self-appointed usher in of human aviation - powered by sound waves. 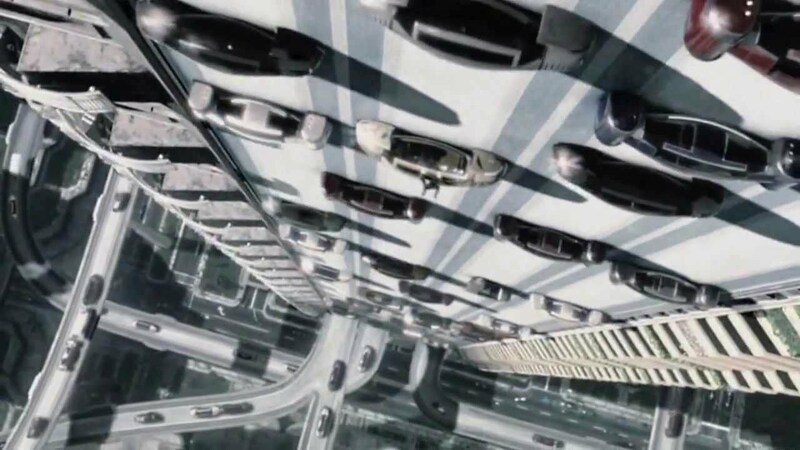 Movies like Minority Report depict cars which can drive vertically or under an elevated roadway, presumably utilizing magnetic attraction. Orthosonic lift (O-lift), provides an efficient alternative means of doing this aerodynamically, with sound waves. That may sound preposterous, in view of the perceived weakness of this phenomenon but there's a reasonable chance you'll be flying mass transit home from work, not too long from now. How do these fictional cars adhere to vertical walls? Since we detect most sound waves only with sensitive ears, we tend to consider them too weak to do much that's useful mechanically. However, you may recall a high school demonstration in which a tuning fork vigorously conveys its energy to water. The energy is there if we know how to use it, in the case of O-lift, by concentrating and containing it. 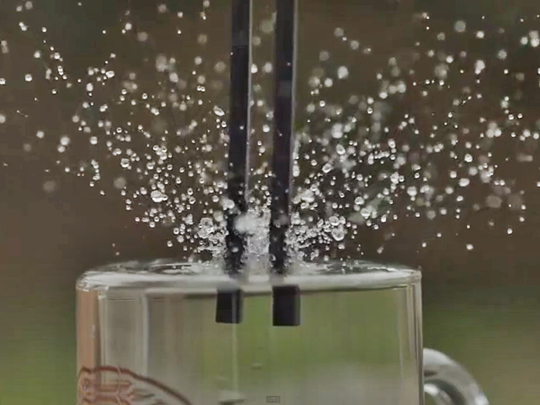 Water sprays from an energetically vibrating tuning fork. Conventional aircraft make a moot point of the sufficiency of air to sustain objects of greater density. A question arises as to whether that accomplishment is limited to methods employing steady flow. Electric applications make use of both direct current (DC), as in a flashlight and alternating current (AC), as in a washing machine. Ironically, though electric "currents" derive that name by analogy to fluid currents, after more than a century of human aviation, only DC applications have emerged. Even helicopter rotors, despite their ever changing direction, experience DC flow continuously from leading edge to trailing edge. Bernoulli's principle illustrated. Higher velocity flow is associated with lower transverse pressure. The squared velocity term (v2) yields the same pressure difference (∆P) from either forward or reverse flows. Thus, despite zero net flow, alternating fluid flow is accommodated by use of its root-mean-squared velocity, just as it is for electric power dissipated by AC through a resistor. This is the basis of orthosonic lift. I built an acoustic wind tunnel by mounting subwoofers, facing in, at opposite ends of a plastic tube. They were wired (180° out of phase), so that the speaker diaphragms would vibrate left and right in unison. A balsa wood airfoil suspended in the tube clearly lifted at modest power. Opposing subwoofers make an acoustic wind tunnel of a tube fixed to ports in their faceplates. From its rest position (left), an airfoil readily lifts at 54Hz, 10 watts (right). I'll save all my questions for when you're done posting, so as not to clutter the overview. Darby wrote: If it doesn't give up too many proprietary details, I'd be interested in seeing an introductory overview about how you convert whatever power source you're using into kinetic energy for lift/locomotion, via sound. That's exactly what I intend to provide. No worries about "proprietary" at this point, since the invention is patented. I must admit, in a word to the wise, that I did lose several claims (all those using O-lift to pick things up) because of a short video that I posted at SPCF. (Uncle Sam is always watching.) The patent office is quite strict about putting in an application prior to making any public revelation. That's a pity, since O-lift could have seen lucrative licenses in applications for contactless lifting (think silicone wafers in clean rooms). USPTO was going to reject the entire application but after arguing crane vs. plane I'm left with vehicles. This is more challenging but also more fun! Jorrie wrote: We may sit up and listen if you can show us that you are anywhere near as efficient as a simple electrical toy helicopter. We obviously would want to see those speakers and the battery on board, like in the toy. I guess I would if you lift the whole shebang and demonstrate some efficiency rating, like watts per kg all-up mass. ... So to demonstrate overall efficiency for a hover, you must quantify the ratio: kg lift (or Newton force) per the rate of energy input. I'll provide video clips of the key experiments. By my 5th post, I'm confident you'll be satisfied. I usually try for one a day. Nothing about Bernoulli's principle requires the lifting surface to be a curved airfoil. In fact, camber (curve height) increases drag and turbulence, which can lead to catastrophic flow separation and loss of lift (stall). With DC, a Bernoulli grip lifts by deflecting air flow laterally across a flat surface. Up lift is greatly enhanced compared to an airfoil, by eliminating entirely flow beneath the object (and its attendant down lift). A constant supply of pressurized air to this Bernoulli grip maintains a non-contact "air bearing", which suspends the object aerodynamically. If you're an experimentalist, you'll be glad to know that you can safely and inexpensively reproduce all the experiments I show at home. With reasonable precautions, they should pose no more hazard than your home audio system. Nevertheless, I must advise that adult supervision is required and that you proceed at your own risk. I use an inexpensive function generator but you don’t need a dedicated box. Just search for a free "function generator" app on your favorite device. That's what I used for my demonstration at the USPTO in Alexandria. I used a cheap cable and amplifier as well. The headphone output from the function generator app goes to the input of the amp. One channel of the amp is used to drive the speaker and you're good to go. Hearing protection is required if you intend to experiment with higher frequencies or amplitudes in the audible range. P.S. I'm not shy about "rescuing" lab equipment from what my neighbors put out as trash. My wife and I frequently take walks in the evening. She brings the dog, I bring a flashlight. When folks upgrade their home audio or theaters, jackpot! An old subwoofer box is easily opened to retrieve the driver. Discarded 5.1 home theater systems usually suffer from failure of the DVD player. That leaves 6 amplifier channels for me to play with. My wooden faceplates can be fashioned out of a few layers of cardboard glued together. You get the idea. Budding scientists without much cash (like M. Faraday was) always find a way! I chose the term "orthosonic lift" to distinguish it from "acoustic levitation". The latter typically positions small objects, such as Styrofoam beads or water droplets, with acoustic radiation pressure in the direction of sound propagation. This applies to both incident and reflected wave components of a standing wave, locking objects at displacement nodes. By contrast, O-lift results from pressures orthogonal to the direction of sound propagation. Thus, my slogan "Sound's Right", refers to forces developed at a right angle to propagation. As you've seen (AC/DC video), O-lift picks up a lot more than Styrofoam, even without the benefit of a standing wave. Lift efficiency was 0.025 N/w. Hanging a "round" with sound. Suspending 126g at 65Hz with 50watts. By now, another aspect of Bernoulli's principle may be apparent. There is no obligatory flow thickness. Pressure on a wing derives only from the particles which come in contact with it. Lift efficiency is greatly enhanced by limiting the volume of air through which energy is distributed. Confining flow to a very thin layer over a wing reduces its volume and increases energy density. This is accomplished by means of a flight deck (track) closely approximated to the wing. Are there any loudspeakers powerful enough to lift their own weight? Mostly, the answer is no. Ferrite magnets are quite heavy. But among those with rare earth magnets, the answer is sometimes yes. Neodymium alloy (NIB) magnets have over 10 times the magnetic strength per gram of ferrite. A suitable NIB speaker was found after testing many. This, after first compiling a spreadsheet comparing specs on a few hundred. Fitted with a simple but adequate, ported, cardboard wing and placed against a horizontal track, an orthosonic vehicle was born...airborne! First flight! A little tenuous but lift efficiency was 0.091N/w. The best videos start with my next blue-titled post. Assuming "GEV" meant ground effect vehicle, rather than "grid enabled vehicle", there's a bit of a difference. With ground effect, a vehicle rides on a cushion of pressurized air. With O-lift, the vehicle slides around on a film of depressurized air. It's a tracked-flight system (so far). This version slides around on overhead tracks and walls. That seems quite limited and it is. But O-lift can go places other aircraft can't! Have you ever seen a 747 in a subway tunnel? O-lift competes favorably with maglev. No need for liquid nitrogen-cooled, superconducting magnetic coils or (in the other version) obligatory an velocity, to induce magnetic fields in a metal track. The latter requires wheels for when it stops to let passengers on and off. In my experiments, I tend to use relatively low frequency sound which is very forgiving of my imprecise machining. The amplitudes can also be quite low because efficiency is so high. Less loud than conversation. Really, you ain't seen nuthin' yet! Having established that O-lift vehicles are possible, the focus shifted to improvement. The same fundamentals apply here as elsewhere in aviation. Ever seeking higher power to weight, I noted various loudspeakers offer advantages at different frequency ranges and wing sizes. The trend to thin, light portable information devices has fostered similar innovations in attendant audio technology. Instead of conventional loudspeakers, inside a typical smart phone are devices called "exciters". Exciters, such as this one, not only employ light NIB magnets, they eliminate the speaker cone and its metal cage. To produce audible sound, its voice coils oscillate a coupling plate which in turn, vibrates an adjacent flat panel of the smart phone case. This second video (<2 min.) is my favorite. It shows a 34g orthosonic vehicle suspending itself against a glass deflector with an oscillating 6” oak tag wing. While subsequent experiments will demonstrate remarkable developments, this was the first prototype, marking the essential form for compact, quiet, competent O-lift vehicles. *While I have no intention of prohibiting individuals from scientific experimentation with orthosonic lift, I must remind readers that, as with any patented technology, it is unlawful to manufacture, market or sell orthosonic lift vehicles without a license (from me). In scaling down the design, I first went to the smallest exciter available in combination with a clear 3" cellophane wing. At 8 grams, it flew in a wide frequency range but seemed best at 740Hz. Lift efficiency was well maintained (0.31 N/w) at this scale. Importantly, in the video (1.3 min.) I show it being smoothly and easily repelled about by a small magnetic wand. This illustrates the opportunity for locomotion by magnetic induction, as is used with maglev and numerous modern roller coasters. Even smaller vehicles were driven by piezo elements, which are substantially more efficient electrically and can scale down much further in size. My smallest was 0.5 grams but this video (2 min) is of a 2 gram version, using a 3" wing cut from a magazine page and flying at 1,450Hz and 12.5 VRMS. Piezo elements are essentially capacitors, which my power meter is not made to measure. To scale up, I tried a heavier, higher power exciter. Operating at 240Hz, 15 watts it was able to aerodynamically suspend a 502g payload with the same 6" oak tag as my last post. Compared to that, this 117g vehicle scales power up 25 times and lift 18 times, for a lift efficiency of 0.41 N/w. The musical fruit (canned beans), playing a different tune (specifically, 240.3Hz, 15w). Stiffer wings with even larger radius will produce more lift? Or no? hyksos wrote: Stiffer wings with even larger radius will produce more lift? Your intuition is good, hyksos. Like musical instruments, each O-lift vehicle should be "tuned" for optimum performance in the role for which it is intended. Choice of material makes a big difference in character. The oak tag wings are cheap and easily cut from ordinary file folders. I started with 10" diameter and, after testing over a wide frequency range at a set power, I repeated the procedure, each time cutting away about 1/4" from the rim. 6" worked very well. Going smaller also worked but required higher power and some loss of mobility as the pressure changes got so large as to invoke friction. Different exciters have different masses, power capacities and resonant frequencies. None of the designs, so far, show optimum performance at what might be considered resonant to the wing disc alone (where radius = odd multiples of 1/4 wavelength in air). They all like wave lengths large compared to the wing dimensions, yet have distinct resonant frequencies, which I believe are related to mechanical coupling of the exciter to the wing. Larger than 10", oak tag tends to droop at the rims and even smaller diameters will warp or bend after repeated crashes or heavy payloads. I have to be careful though. Too stiff, as with corrugated cardboard, and the wing becomes more of a piston, having a near field effect which repels (develops positive radiation pressure), rather than lifting the vehicle. What O-lift requires is a central oscillation which deflects laterally ("orthosonic lift by radial deflection"). It is Bernoulli's effect wrt that lateral AC flow field, from which this method derives lift. To avoid damage from frequent crashes, I typically do preliminary testing on a Formica table top, using a spring scale (like the Wright brothers did with their kites) to determine lift over a range of frequencies and powers. The wooden beam acts as a stiffener, to preserve flatness of the oak tag wing shown. You'll see my result using a beam stiffener (as shown above) in the next blue-titled post and with an aluminum wing in the one after that. There are limits to the power handling capacity and structural strength of individual exciters available in this convenient size range. So, in considering designs capable of greater lift, a simple, two-exciter array was used. Wiring the exciters 180° out of phase, the AC flow between them becomes supercharged, as it was in my acoustic wind tunnel. Compared to air oscillating peripherally about a single exciter, here air is both pushed and pulled between an exciter pair. With the array, the O-lift vehicle scaled up not just in lift capacity but also in lift efficiency. In addition, the opposed phase greatly reduced the intensity of audible sound leaving the vehicle (noise cancellation). Including the 5 lb. brick payload, the system weight was 5.65 lbs. (2,567g), giving a lift efficiency of 1.26 N/w, more than twice the efficiency observed with similar, single exciter designs! This demonstrates that O-lift vehicles have the capacity to carry batteries and oscillator-amplifier circuitry in addition to meaningful payload. In view of the advantage found with a dual-exciter, linear array, I believe O-lift vehicles may further increase efficiency with planar arrays. In the diagram, red exciters are 180° out of phase with black. With a four-exciter, planar array, all the exciters would have supercharged AC flow along two axes instead of just one. A nine-exciter, square array would contain a central exciter surrounded by four supercharged flows with its neighbors. Larger arrays would have more such, "saturated" exciters, maximizing lift efficiency. Engines may thus be distributed evenly or as desired over a lifting surface. Two-, four- and nine-exciter arrays with supercharged AC flows indicated by arrows. *You can buy tempered glass. But you guessed it, the "flight deck" (track) in my video was sitting in my neighbor's trash pile! It had been the glass door of a video display cabinet. They're meant to take a hit from a child's toy without shattering. Hmm. So I'm thinking kickstarter. Or call Elon Musk directly in his office. As of this date, my video links are unlisted. If you know someone skeptical about flying a brick with sound waves, invite them to SPCF to have a look. Maybe you can win a bet! In addition to the YouTube window, I provide direct video links in my posts, in case a full screen view is desired. In this experiment, I substituted a 6" diameter aluminum wing in a single-exciter configuration. At 0.4mm (1/64") and 20g, it was about twice the thickness and five times the mass of oak tag. Care was taken not to bend the aluminum while cutting out the disk. A heavier, high capacity exciter, enhanced mechanical coupling to the stiff metal wing. With a 350g payload, the system (total 497g) suspended well at 51Hz with only 0.5w. (You read that right!) Lift efficiency set a new record of 9.74 N/w as shown and hit 10 N/w off camera, by dropping the power a smidgen. I've been providing the lift efficiency of each experiment in N/w (newtons of lift per watt of electric power supplied). I'm afraid that doesn't mean much without a reference value. This MIT report gives "...a jet engine's 2 newtons per kilowatt" (i.e. 0.002 N/w). That means O-lift provides 5,000 times the lift efficiency of a modern jet engine! That I, as an amateur experimenter, could accomplish this with off-purpose, off-the-shelf parts, speaks to the robustness of the underlying theory. I believe O-lift is as far from optimized at this point, as the Wright's Flyer 1 was compared to today's aircraft. The second century of human aviation can no longer afford to ignore the efficiencies available with AC flow, as exemplified by orthosonic lift. You're now free to move about the cabin. Impressive as your orthosonic lift sounds, I'm not that impressed. Firstly, I do not see the correspondence to a jet engine's or ion engine's thrust at all. I think you are comparing apples and berries. Jet/ion engines do work, lots of work on the payload, while your device seems to do no work on the payload. I can simply hang the tin to a fair sized suction cup stuck to the glass plate and it will stay there with zero further watts applied ('infinite efficiency'). Or have I missed something? Quite possibly, but I cannot recall having seen how orthosonic lift would propel a craft through air. That said, there are probably some applications for such a device that are still to be dreamed up - I think you did mention levitation transport systems before. It will all depend on the effectiveness of the levitation and the amount of drag reduction that can be achieved compared to magnetic levitation. Jorrie wrote: I'm not that impressed. Jorrie wrote: ...suction cup stuck to the glass plate...will stay there with zero further watts applied ('infinite efficiency'). I don't think we want to be too naive about this. A suction cup requires work to create the suction. There's also virtually no mobility because of the need to maintain the peripheral seal. Though O-lift prefers a glossy surface, it will suspend against imperfections as in concrete and wood (my second video did), where suction cups won't adhere. I was very fortunate to be in correspondence* with the author of this article over the last 3.5 years, as I developed O-lift. It's the only article either of us is aware of, which addresses aerodynamic lift at the particle level. Conventional texts do "finite element analysis", where the fluid is considered in infinitesimally small volumes. The trouble is, that's not what real fluids are. A finite element maintains fluid properties, such as pressure and temperature, all the way down, even though we know those are emergent behaviors of statistically large groups of particles. Prof. Crummer and I are convinced that, unless we understand aerodynamic lift at the level of actual particles, our understanding is incomplete. This was the view adopted by Maxwell, Boltzmann and Daniel Bernoulli (in "Hydrodynamica"), as they developed the kinetic theory of gases. On viewing my AC-DC video, Prof. Crummer replied, "You nailed it." regarding its description of lift deriving from radial flows. The increased understanding of AC flow dynamics alone is worth studying O-lift. *Yup. Sometimes they write back! Suction provides lift by means of a relative paucity of air particles in a given volume. O-lift results from entrainment of particle motion rather than evacuation of particles. The more of a particle's average motion that occurs parallel to a wing, the less which occurs normal to it. Thus, orthosonic lift. (That's why it's called aerodynamics.) The thin layer of oscillating air communicates freely with surrounding ambient air. A steel ball bearing does no work on its load either, but that doesn't make it unimpressive. One of the reasons O-lift is exceedingly efficient is that aspires to pure lift, moving as little air as necessary, yet providing an air bearing. There's essentially no heat, exhaust or obligatory velocity. The patent office cited my own video, posted here and containing this frame, where I lift a 2" square of cardboard with O-lift, as prior art. It preempted all my crane-related (picking things up) claims. (Live and learn.) But just because I won't be permitted to capitalize on it, doesn't mean society won't benefit from this aspect of O-lift. 1g white cardboard square held by O-lift in an earlier thread. This video shows a common use of a Bernoulli grip. Part way in, it clearly diagrams the tube which must continuously supply clean, pressurized air. O-lift obviates the air supply and lifts at 1/500th the power! Jorrie wrote: levitation transport systems...will all depend on the effectiveness of the levitation and the amount of drag reduction that can be achieved compared to magnetic levitation. While the world awaits a "room temperature" superconductor for the magnets, O-lift works just fine on a hot day, no liquid nitrogen required. The profile of the lift mechanism is quite thin, so the vast majority of drag will come from the vehicle's other dimensions. O-lift will weigh less than maglev and be at least as efficient at producing lift as current systems. Jorrie wrote: I cannot recall having seen how orthosonic lift would propel a craft through air. Some of my systems generate modest rotation and locomotion by virtue of asymmetric wings or off center placement of the transducer. Interestingly, that seems to invoke frequency and amplitude dependent motions which reverse. I haven't studied them carefully. Transducer arrays are interesting. Imagine several transducers lined up along a rectangular wing. The phases of their oscillations can be adjusted so as to send packets of air down the line in a high frequency, peristaltic pattern. Thus, in addition to providing lift, a reactionary propulsion should be obtained. I don't know how powerful this can be. I doubt it would be useful to anything with great inertial mass. So, I'm left with linear induction as the preferred means of locomotion, just as with maglev. It's nice because that can also provide regenerative breaking. I demonstrated this potential in a video above. Clearly mobile. A magnetic wand easily moves an O-lift vehicle through a glass flight deck. Jorrie wrote: I do not see the correspondence [of O-lift] to a jet engine's or ion engine's thrust at all. Force (as pressure) is being generated by all but clearly, neither pretends to be the other. I have a separate patent pending for "orthosonic thrust". Looking at your invention, it seems the affect of producing a differential pressure across a surface is static as opposed to producing a continuous flow of air or gas. Any thoughts on producing compressed air or gas with this similar to the Macrosonix concept? PS: If you have or come up with a concept for compression that is different from the MacroSonix one, I'd suggest not posting it since as you know, that prevents you from patenting the idea. I would however, like to hear about it so perhaps PM me if you'd like. Thanks for the cool references. MacroSonix had an advanced understanding of sound waves, especially for the time. It was astute of you to make the connection. You also intuited a correct distinction. For O-lift, I use the pressure changes you refer to. For orthosonic thrust (O-thrust), my starting point was coincidentally, very similar to the method described in the MacroSonics compressor (patent 1). Where I ended up was something quite different and no longer applicable as a compressor. It still manages to serve as a heat exchanger however and I actually included a claim to that effect. It might be surprising to some that aerodynamics of flight and heat exchange are closely linked. But other things being equal, pressure and temperature are closely related by the ideal gas law, PV = nRT. What works for one, often applies to the other. For example, this wing causes visible condensation by cooling humid air as it passes over, just where pressure drops to generate lift. Few are aware that in 2012 Amazon bought Kiva Systems and converted one of its many product warehouses to robotic operation. This video makes clear that most of the warehouse is now a "human exclusion zone" in order to give robots the right of way as they proceed at three times human productivity. I have no problem with robots taking over mundane human tasks. However, I must point out that every warehouse always had a "human exclusion zone" called "the ceiling", which remains woefully underutilized, even at Kiva Systems! I like to imagine an O-lift system combined with the mobility of a Segway™ and given robotic control. These could zoom right over warehouse shelves, rather than drive around them (or their supporting legs). They could drop a basket, at the exact location of the product, to a human or robotic picker residing in each aisle. I don't think humans should have to yield the floor and O-lift provides a mechanism which enables us to keep it. Dancing on the ceiling! In addition to providing surveillance (banks, casinos, etc. ), ceiling crawling robots could provide mobile monitoring of radiation and other hazards from above. They may also expedite physical storage and retrieval at warehouses. Yea, that might work if a strong and smooth ceiling can be installed! Jorrie wrote: Yea, that might work if a strong and smooth ceiling can be installed! Admittedly, strong smooth walls are more common. Late last year ThyssenKrupp, a large German conglomerate, announced that they would revolutionize architecture by developing cableless elevators that go sideways as well as vertically. It's reported to employ a maglev mechanism. I see no reason why O-lift can't provide an air bearing attachment to a wall, allowing free navigation in any direction of its plane. While magnetic induction could provide locomotion, steerable wheels would give more freedom and be less costly. Skyscrapers might be serviced by two shafts for up and two for down, like a modern highway. The inner lane of each would be for "express" cars, which pass cars in the outer lane, which have slowed as they approach their floor. Upon arrival, cars exit laterally to parking spaces on each floor for loading and unloading. Important to either system is the absence of cables which limit current systems to one car per shaft. Cableless cars enable real, computer-controlled traffic. At the end of a lane, cars loop to lanes going the other direction. A electric, wheeled system with traction provided by O-lift would use regenerative braking on the way down, recovering much of the energy invested in the ascent. It would also assure that, in the event of power outage, the descent self powers the system on the way down. With O-lift, shafts aren't even necessary. An entire wall can be freely accessed. You could conceivably be whisked directly from the lobby to your hotel room on the 58th floor! Re: Wall Walker to the Rescue! I mentioned wall- and ceiling-crawling robots above, deriving locomotion by attached motorized wheels. Another way to take advantage of O-lift's static lift (i.e. no obligatory velocity) is to incorporate it into "foot pads" of a wall walking robot. The foot pad would include a traction element, such as rubber or grit brake "shoes" (shown in red), which engage the surface of navigation through a spring mechanism. Pressing a foot against a wall with O-lift activated holds the brake shoe tightly against the surface, under the pressure from the springs. When the forward foot has a hold without slipping, the back foot can release, by deactivating its O-lift, and be repositioned one step ahead. Stepping over a ledge, a wall walker robot ascends a vertical wall. Replaceable brake shoes (red), matched to the surface, provide grip against slipping. A wall walker could incorporate a number of these units working in parallel or tandem combinations to haul larger payloads (not shown), perhaps even carrying a child down to safety. In this way, an emergency response team might send a wall walking robot up the side of any building with flat walls of concrete, glass, steel, etc. With legs, such a robot could even step over obstacles, such as window sills and ledges, while carrying supplies (medicine, communications, rope, gas masks, etc.). This video a wall & ceiling crawling vehicle announced in 2011, which employs two supersonic Bernoulli grips. It works fine but requires an umbilical tube supplying 140 liters/min of pressurized air. It was reported to be 5 times more efficient than prior Bernoulli grips, thus able to support its own weigh plus a payload. The wheels are the type you would find in a radio controlled model car. O-Lift requires no air supply tube because oscillates the same air continuously. O-lift is also at least 50 times more efficient in terms of lift per watt (so far) than the design shown. Both are benefits of AC over DC aerodynamics in this type of application. Dave, how sure are you about the "50 times more efficient"? Do you know exactly how their efficiency is calculated? "While Bernoulli grippers are fine for picking up things, they're not generally strong enough to enable a robot to support its own weight, much less climb. A research group from the University of Canterbury in New Zealand has developed a supersonic version of the Bernoulli gripper that's five times stronger than the conventional version, which is enough to allow a robot to climb... all without using any additional air volume or pressure." then, convert to 60 watts. So 5.5N/60w = 0.092 N/w. This is for a simple isothermal expansion, though the decompression is actually adiabatic. Flow volume is conventionally provided in terms of standard temperature and pressure (STP) to make the calculation simple. If the supersonic grip is 5 times as efficient as that, it yields 0.46 N/w. With a 6" aluminum wing above, O-lift achieved 10 N/w or 21.7 times that reported for the new grip. However, my patent attorney (also a mechanical engineer), felt my calculation was impractical because gas supplied to Bernoulli grips is not originally compressed with 100% efficiency. He simply looked up the power consumption of a modest, "real world" compressor, capable of supplying 140L/min at 5atm. This was 1,100 watts and yields a practical lift efficiency of 0.005 N/w. In that case, O-lift is 2,000 times as efficient! I thought 50 times was a reasonable compromise, considering I have not yet fully optimized the method. I used about $25 of off-purpose, off-the-shelf parts, whereas the supersonic grip uses a custom, non-contact adhesive pad (NCAP) to be made available for "a few hundred dollars". And it has to drag that air supply tube wherever it goes. *consistent with my old college text, Basic Physical Chemistry for the Life Sciences, Williams & Williams, ©1973, p48. "And it [Bernoulli grip] has to drag that air supply tube wherever it goes." I guess O-lifter must drag electricity supply (cables or battery) with it as well, but it seems to be less of a problem. Re: Can you tell I shop at Costco? From time to time, I'll post updates. Recently, I combined the above, rigid aluminum wing with the dual exciter array. This allowed me to aerodynamically suspend a can of peaches, setting a new record for lift capacity and efficiency. Peachy Keen! O-lift aerodynamically suspends 8 lbs. with the power of a single incandescent nightlight! In either case, the payload represents sufficient capacity for O-lift to carry both battery and oscillator circuitry. However, I continue to expect mass transit and elevator applications to be powered externally, as with current systems. Forgive me in advance for my not having read the whole thread yet (just the latest post), but the bottom of can is no doubt lipped, and the counter is immediately next to your mechanism, so the air column is partially confined and you're pushing against the counter ... in other words, ideal hover conditions. Can/will this paradigm work in an unconfined open space with nothing to push against but air ? If yes, that would be a total game changer, but I'm guessing not. I'll stop there since I havent read enough to comment further.